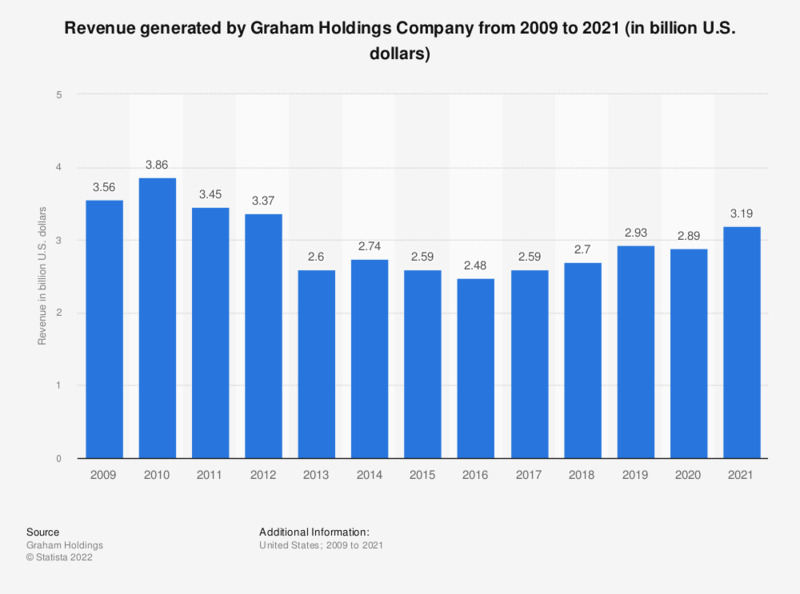 This statistic presents data on operating revenue generated by the Graham Holdings Company from 2009 to 2018. In 2018, the Graham Holdings Company generated a total revenue of 2.7 billion U.S. dollars, up from around 2.6 billion a year earlier. The Graham Holdings Company is a continuation of the Washington Post Company in 2013 after the WPC sold its namesake newspaper, The Washington Post, to Jeff Bezos, the founder of Amazon.com. The company revised its Consolidated Statements of Cash Flows for the years ended December 31, 2013 and 2012 to properly eliminate noncash capital expenditures. Figures for 2010, 2011, 2012 and 2013 were adjusted accordingly. Figures for periods before 2015 come from previous annual reports.